The first thing to know about Professor of French Thierry Boucquey is that he has a personal motto. The second and more important thing to know is that he actually lives by it. “Mens sana in corpore sanois, a Latin phrase meaning ‘a healthy mind in a healthy body,” says Boucquey as we sit down together on the occasion of his retirement from Scripps. “I do my best intellectual and academic work when my body is in shape, and I teach that approach to my students, too.” Indeed, one would not be remiss to mistake the professor for a world-class athlete upon encountering him walking—or rather, running—across campus (he can’t remember a day when he didn’t exercise). Boucquey has competed in master’s track and field events for over 40 years, most recently coming in sixth place in the world championships in Korea—all while maintaining a prolific research and teaching dossier. During his 33 years at Scripps, Boucquey has been an active force in his research field, in the classroom, and in the College’s administration. But Boucquey sees as his most profound contribution to Scripps his Core III course, Foreign Language and Culture Teaching Clinic, which will have its 20th—and final—edition this fall semester. He recalls fondly when he conceived of the course: “The dean asked professors to come up with Core courses. I figured, I’m a specialist in French medieval literature, which is pretty esoteric, and I teach French, so I thought, why not teach how to teach language?” Since he devised the course, over 400 students have passed through. Boucquey starts the semester with a teaching demonstration entirely in Flemish, aimed to highlight how to communicate effectively across language barriers (which he does with ease). This is followed by three weeks of pedagogy training and, finally, a clinic at a local elementary school, where Scripps students who are native or very advanced speakers of a foreign language teach it twice per week. Following the clinic, the class reviews videos taken during those teaching sessions to critique and improve upon their pedagogy. 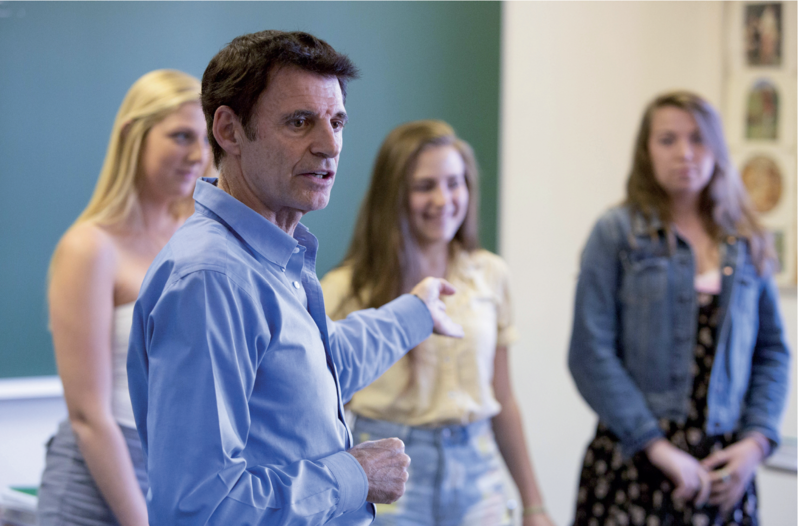 The teaching clinics have been so successful that Boucquey and six of his Core III students published a book, 100 Games and Activities for the Introductory Foreign Language Classroom, which has sold over 6,000 copies to date. “It’s one of the highlights of my career, seeing students blossom and do so well in the course,” says Boucquey.